Idaho's wolf hunting season, the first since the animals were removed from the endangered species list, came to a close Wednesday, falling short of the limit established by the Idaho Fish and Game Commission last summer. Since Sept. 1, 187 wolves were killed in 12 zones throughout the state, 33 fewer than the limit. Of those zones, seven were closed before the end of the season because of filled limits. Ten wolves—the full quota—were killed in the Southern Mountains zone, which includes the Wood River Valley and extends east across the Pioneer, White Knob, Lost River, Lemhi and Beaverhead mountain ranges to the Montana border. Of those, two were likely members of the Phantom Hill pack, which has denned in the northern Wood River Valley. "The season has succeeded in halting the growth of Idaho's wolf population," Fish and Game Director Cal Groen stated in a news release. "It showed that Fish and Game is capable of monitoring and managing a well-regulated wolf hunt." Groen added that hunters complied with the rules and didn't partake in a "wholesale slaughter," as some conservationists feared. 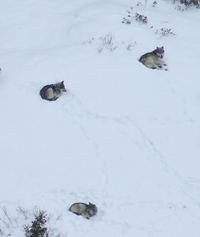 By the end of the hunt, Idaho had an estimated 796 wolves in 94 packs, and 49 packs are considered breeding pairs. The average pack size was 7.8 wolves. A total of 142 wolves are radio-collared. Harvested wolves ranged in size from 54 to 127 pounds. Fifty-eight percent were male and 15 percent were juveniles less than one year old. About 86 percent of the wolves killed were taken by resident hunters, and 12 of the wolves checked in were wearing radio collars. Hunting success in the zones ranged from two wolves taken in the Southern Idaho zone to 49 in the Sawtooth zone.